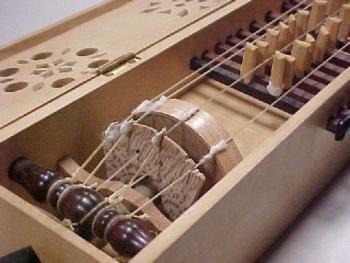 The hurdy-gurdy is the first stringed instrument to which the keyboard principle was applied. The French name, Viella a Roue (wheel fiddle), describes the method by which sound is produced. The bowing action of the fiddle is replaced by a wheel cranked by a handle. The outer rim of the wooden wheel is coated with resin. When the crank is spun, the wheel turns and the gut strings vibrate. Just as the bag of the bagpipe acts as a reservoir of air for continuous sound, so too the wheel makes possible continuous sound by avoiding changes of bowing. Both bagpipe and hurdy-gurdy use drones, provided in the former by reed pipes, and in the latter by strings which sound fixed pitches. Other strings tuned in unison provide notes of the scale. Tangents activated by keys press these strings at the appropriate points to produce different pitches. 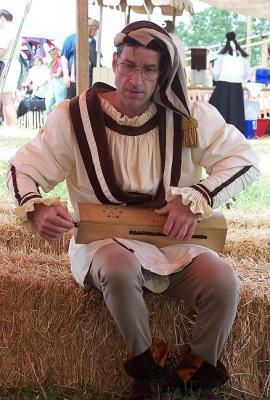 There is evidence of the hurdy-gurdy in Europe in the twelfth century. By the end of this century, the instruments was highly regarded. 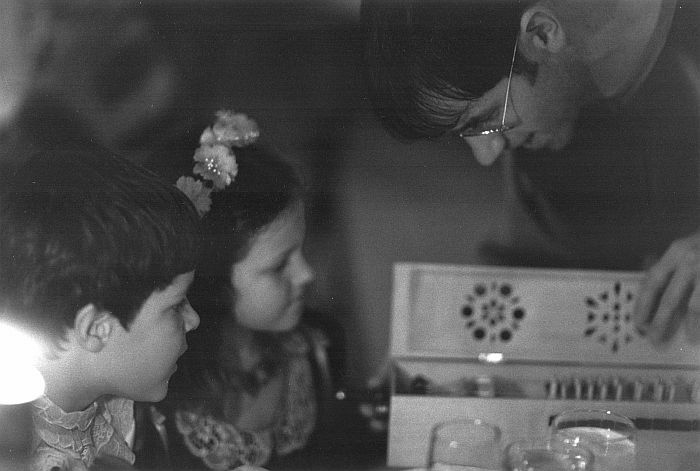 Before 1300 the instrument was often long enough to require two performers, one to crank, and one to push the keys. 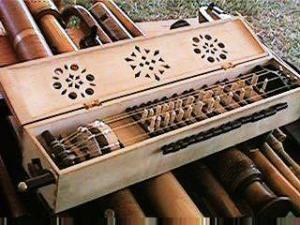 Single player instruments developed in the thirteenth century when the hurdy-gurdy became the ideal instrument for dance music. 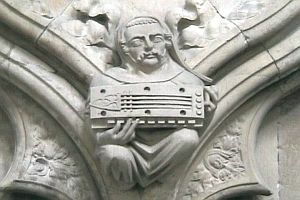 Musica Antiqua's hurdy-gurdy, really a four string symphonie or organistrum by Ellis, is based on a late fourteenth century Florentine marble fingure in the Vienna Leichtenstein Gallery. It has two unison chanterelles, two drones, and an interior pegbox. It is oblong in shape and has tuneable tangents and a range of two diatonic octaves with drones on gand d1. The gut strings are difficult to keep in tune when there are changes in temperature or humidity. Notice the cotton wrapped around the strings to keep the circular bow from wearing through the strings.